The Thunder won with 10 balls to spare. 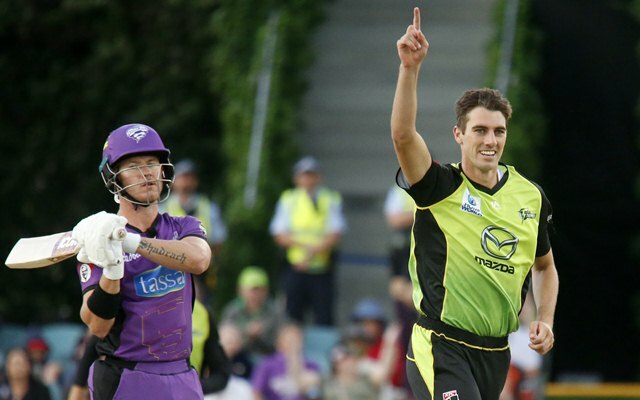 The Hobart Hurricanes had nothing to worry prior to their match against Sydney Thunder as they had already qualified for the semi-finals. However, the Thunder were in a slight chance to stay alive. The team, captained by Shane Watson, won by four wickets (DLS Method) in Canberra, but they couldn’t get their Net Run Rate high enough to progress to the subsequent rounds in this year’s Big Bash League. The Thunder won the toss and did a reasonable job, restricting the Hurricanes to 165 for four in 20 overs. Rain threatened to play spoilsport and play was halted inside the mandatory powerplay. The match was reduced to 19 overs per side. D’Arcy Short succumbed to a rare failure as Pat Cummins rattled his woodwork in the third over. Caleb Jewell was the second wicket to fall in the sixth over. He was dismissed by off-spinner Chris Green. Matthew Wade scored 45 runs from 29 balls and became Cummins’ second victim, much to the Thunder’S relief. Nevertheless, Ben McDermott and George Bailey cobbled together a decent partnership of 94 runs from 59 deliveries. McDermott remained not out on 44 and Bailey was run-out for 53 runs with four boundaries and two sixes in the last ball of the innings. For the Thunder to qualify, they were needed to track the target down in 11.3 overs. Nevertheless, the task eventually turned out to be a far cry for them. Usman Khawaja and Shane Watson put on 23 from 13 balls after which Riley Meredith accounted for Watson’s wicket. Usman notched 36 runs from 21 deliveries and he was cleaned him up by Qais Ahmed. D’Arcy Short got rid of Anton Devcich for four. Short picked his second wicket, sending back Daniel Sams. Keeper Matthew Gilkes perished for a golden duck to Qais Ahmed. Thereafter, Callum Ferguson and Chris Green put their heads down and ensured that the Thunder don’t suffer many hiccups. Ferguson was nipped out for 47 by Jofra Archer, but by then Sydney were on the brink of victory at the Manuka Oval. Green remained not out on 34 from 28 balls. Pat Cummins is different class. Pat Cummins returning to BBL after a long time and he cleans up Short in the first over. You beauty Callum Ferguson ! !